It was a dramatic end to a fantastic regatta when STIG's Alessandro Rombelli with tactician Jonathan McKee and crew Giorgio Tortarolo, came from behind during the final leg of the last race to charge across the finish line two places ahead of Italian, Luca Lalli on B-Linsailing.com. "We never imagined on the way out to the race course today that we would win. With Lorenzo Bressani and Federico Michetti onboard with Luca, we knew that would be a very tough combination to beat." said Rombelli. 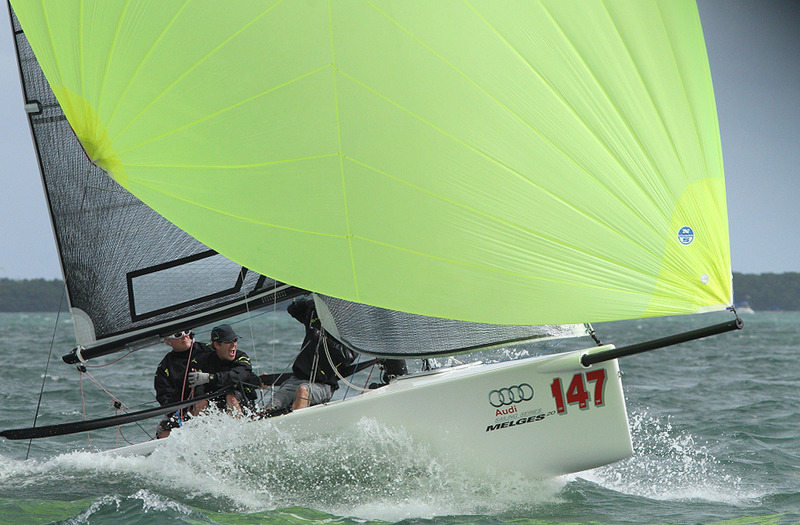 "I think consistency was very important for us and we were very fast downwind. There was some great match racing between us on that last run." "It was a classic last race," McKee added. "The deciding point was at that last top mark. When we rounded, literally, we were right on their stern. We knew that was the whole regatta. It was all about who was going to beat who. And, with the conditions like they were, it was all about how you approached the finish line. At this event, that counted for a lot of points and position." Russell Lucas' Shimmer claimed a well-deserved third overall, while Paul Reilly's Red Sky had another successful day to finish fourth. Michael Kiss on Bacio and his double-bullet performance enabled him to move from seventh overnight to finish fifth overall.